10 HP Compressor with 120 gallon vertical tank. 5 HP Compressor with 80 gallon vertical tank. 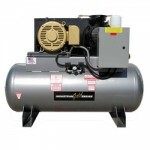 7.5 HP Compressor with 80 gallon vertical tank.